The winter season will soon be upon us, so I have invited Elizabeth Carrollton of Drugwatch.com to guest blog on some of the fall hazards that are part of the ice and snow of winter in the Midwest. Falls are a serious health risk for seniors. Each year, one of every three adults 65 or older falls, according to the Centers for Disease Control and Prevention. Nearly a quarter of a million of those seniors will fracture a hip when they fall, which requires surgical repair or hip replacement. Traumatic medical events of this nature can change lives, taking a major toll on mobility and health, so it’s very important to take measures to help your senior family members reduce their risk of falls. 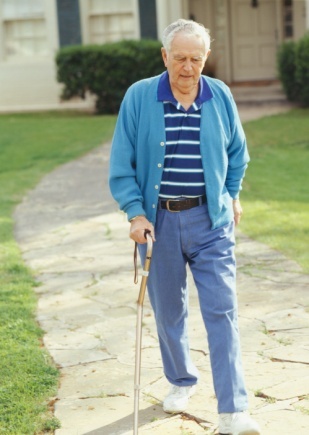 Strength and Balance Issues: Muscle weakness can make seniors much less stable on their feet, increasing risk of falls. Inactivity is often at the root of that weakness. Encouraging that older adult you care about to exercise can prevent balance and stability issues. Just 30 minutes a day of moderate exercise will do, which can be accomplished with a daily walk after lunch or an exercise class at the local senior center. If instability is already a problem, seeing a physical therapist to improve strength and balance should be a priority to prevent falls and serious hip injury. Check into Nutrition: Poor nutrition is a common problem in seniors. Appetites tend to decrease as we age and digestive problems or other health issues can affect the body’s ability to absorb nutrients. Checking into the eating habits of your loved one and, if necessary, ensuring that wholesome meals are provided can help, as can a good multivitamin supplement that has plenty of B-vitamins, calcium and vitamin D.
Other Safety Measures: Vision problems are frequently a factor in senior falling incidents. Vision can change rapidly once we reach a certain age, so regular eye exams are essential. Clearing the home of tripping hazards is important, like loose rugs or clutter, as is ensuring good lighting. If a Fall Happens: Sometimes, even when the best care is taken to prevent falls, accidents happen. If your senior family member takes a fall, seeking a medical evaluation as soon as possible is important, even if there isn’t an obvious injury. If there are signs of hip injury, such as pain, bruising or swelling, immediate medical attention is crucial. If the hip is fractured, your loved one will need surgery. If hip replacement is necessary, there are some things you should know about hip implants in order to help your loved one choose wisely. Several hip implant products, primarily metal-on-metal types, have been recalled lately over high rates of failure and serious complications. The latest recall involves the Stryker Rejuvenate hip replacement system, which was prone to corrosion and failure. Some patients who received these faulty implants suffered metallosis, a serious condition caused by the accumulation of metallic implant debris in the body’s soft tissues, leading to pain and swelling in the hip and in some cases, tissue death and bone loss. Avoiding metal-on-metal devices might be wise, to reduce risk of complications. Seniors who have already had one of these devices implanted should be monitored for any sign of pain and inflammation that might indicate metallosis. – Elizabeth Carrollton writes about cautions regarding medical devices and drugs for Drugwatch.com. Please visit their website for more information. Charlotte Bishop is a Geriatric Care Manager and founder of Creative Case Management, certified professionals who are geriatric advocates, resources, counselors and friends to older adults their families in metropolitan Chicago. Please email your questions to ccbishop@creativecasemanagement.com. Learn more about our Chicago senior services and how we can help you support your loved one.